Form PHS-7033 is a U.S. Department of Health and Human Services form also known as the "Special Pay Contract - Accession Bonus". The latest edition of the form was released in February 1, 2006 and is available for digital filing. 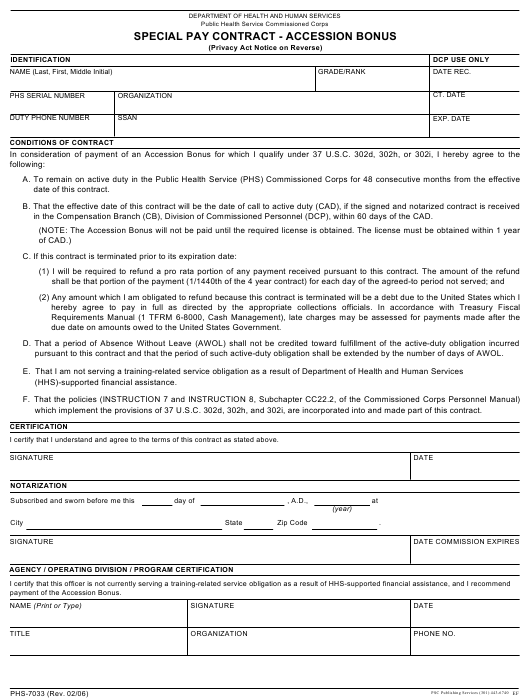 Download a fillable PDF version of the Form PHS-7033 down below or find it on U.S. Department of Health and Human Services Forms website. in the Compensation Branch (CB), Division of Commissioned Personnel (DCP), within 60 days of the CAD. due date on amounts owed to the United States Government. pursuant to this contract and that the period of such active-duty obligation shall be extended by the number of days of AWOL. which implement the provisions of 37 U.S.C. 302d, 302h, and 302i, are incorporated into and made part of this contract. I certify that I understand and agree to the terms of this contract as stated above. payment of the Accession Bonus. 09-40-0010, Pay, Leave, and Attendance Records, HHS/PSC/HRS. for PHS Commissioned Corps officers applying for an Accession Bonus. 9397 (Numbering System for Federal Accounts Relating to Individual Persons). information collected will be used for issuance of personnel orders to authorize payment. owed the Federal government, law enforcement, and litigation. information. All statements are subject to verification.